And while those French investigators have been called racists, a Langy-sur-Marne based mosque was raided this week anyway… And they found a large collection of 7.62 Kalashnikov ammo along with boxes of Islamic State (ISIS) propaganda videos. Authorities also raided one of the mosque’s leader’s homes, and found a revolver hidden near jihadist documents. Police also found recordings of religious chants “glorifying the martyrs of jihad linked to the terrorist organization Jabhat al-Nusra”, the Syrian branch of al-Qaeda, the prefecture added. “No request was made to open a private school,” the state prefecture said in its statement. Mohammed Ramdane, president of the local Muslim association in Lagny, had criticised the closure of the prayer hall at the time, saying: “Nothing has been found in the mosque. Nothing is hidden, we don’t hide anything. France isn’t messing around. 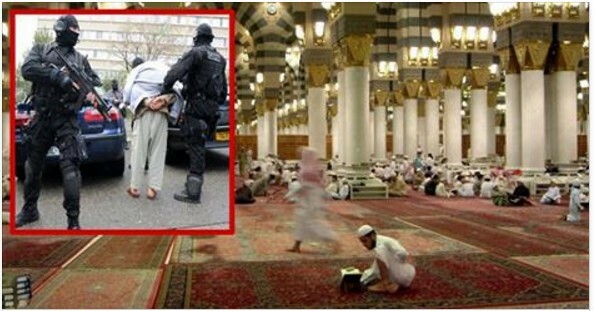 They’ve arrested more than 230 muslims and collected more than 324 weapons. Many others are under travel bans and house arrest. They have shut down three mosques and have raided more than 2,300 homes. Cazeneuve said the number of weapons apprehended so far is staggering. And many French leaders have joined those voices in the EU calling for an end to importing Syrian Islamic refugees, as a proper screening process is impossible. Compare that to the response we saw from President Barack Obama, who tried to blame the attacks on San Bernardino on “workplace violence” for days, while calling on his Attorney General to prosecute those who speak out against radical Islam. It looks like Trump’s comments were right, and it’s time to start treating Muslim communities with suspicion!